I’ve always loved chocolate. Haven’t you? My mom used to buy those Christmas ornaments that were chocolate and covered in decorative foil. She’d hang them all over the tree. One year when I was a teenager in the ninth grade, I consumed way too many chocolate ornaments and ended up having a reaction. My face got all red with teeny tiny bumps, dried out, and then peeled. Lovely—just what every teenager wants to have happen to them. (Why is it that the good-looking boy next to your locker only talks to you when you don’t want to be noticed?) I never looked into why I had the reaction. I don’t think I even equated it to the chocolate exactly. I wondered if it was a new detergent my mom was using, or the soap I used to clean my face. I was clueless—until Easter! Foil-covered chocolate eggs and that big bunny made of chocolate! Let me at ‘em! It happened again. My face got all red, dried out, and peeled. Hmm, I thought. I wonder if the common denominator here is the chocolate? I think we are all slow learners when it involves giving up something you love. You may be wondering if there is a connection between yoga and chocolate other than my loving both. How about Chocolate Yoga Workshops? David Romanelli has created “Yoga for Foodies” and his philosophy is: “The world is a better place if people do yoga. And if they come because chocolate or wine is involved, I’m fine with it.” He offers a couple options for chocolate. He also offers a wine and yoga retreat, but let’s stick to one vice at a time. 1) Two-hour vinyasa flow that offers a chocolate tasting before and after the yoga class. The chocolate is a metaphor emphasizing that anything in life is better, richer, and sweeter when experienced in the present moment. 2) Two hour deep stretch experience called The Chocolate Chakra Tour. As you lie in very soothing yoga postures for 3-5 minutes, he shares stories on the 7 energy centers the yogis call chakras. (See my Chakrascope below for a crash course on chakras.) After class, you experience a flight of 7 exotic Vosges Chocolate truffles, each specifically chosen to stimulate a chakra. Now that I’m gluten-sensitive, chocolate is my go-to dessert. So, to ease my guilt, I collect reasons why my vices might be good for me. So let’s indulge our indulgence! “1. Chocolate contains plant-based chemicals called flavanols that are responsible for many of the benefits chocolate provides. Flavanols are antioxidants that protect the body from both internal and external damage caused by free radicals. External damage can come from sun exposure, pollution, cigarette smoke, and more, while internal damage results from the formation of free radicals due to essential body processes such as breathing and eating. 4. Chocolate is one of nature’s leading sources of a substance called theobromine, which is related to caffeine (another one of my vices that also has some surprising benefits…but I digress.) Preliminary research has shown that theobromine helps suppress coughing and may be an alternative to cough supplements with their side effects and generally unpleasant taste. 5. The flavanols in chocolates help make the platelets in your blood less sticky. That’s good because less sticky means less clotting, and less clotting means a lower risk of heart attacks or stroke. 6. Chocolate has been shown to help lower LDL (“bad”) cholesterol and thereby may help protect against heart attacks. 7. Regular chocolate consumption offers another bonus for cardiovascular health: it helps reduce blood pressure. 8. The high flavanol content in chocolate has been shown to help protect skin from harmful UV damage. Look for the Cocoapro label on M & M/Mars, Callebaut, and CirkuHealth chocolate products for the highest concentration of flavanols. 10. Chocolate has been shown to improve blood flow to the brain, a discovery that may help in the development of new treatments for dementia, vascular problems, and stroke. Even in the absence of those conditions, improving blood flow to any part of the body is usually beneficial. And to expound on number nine above: “Chocolate causes certain endocrine glands to secrete hormones that affect your feelings and behavior by making you happy. Therefore, it counteracts depression, in turn reducing the stress of depression. Your stress-free life helps you maintain a youthful disposition, both physically and mentally. So, eat lots of chocolate!” – Elaine Sherman, Book of Divine Indulgences. Chocolate has long been heralded for its value as an energy source. Think of it this way: a single chocolate chip provides sufficient food energy for an adult to walk 150 feet; hence, it would take about 35 chocolate chips to go a mile, or 875,000 for an around-the world hike. Chocolate has been around for a long time: Chocolate in its solid forms of candy, cake, and ice cream are relatively modern developments. The first known uses of the cacao bean were by the Aztec people around 1100 BC. They made a bitter drink called xocoatl. Recently even earlier evidence of a fermented, alcoholic drink from the fruit of the cacao tree was found in Honduras. Archaeologists trace this back to 1400 BC. My husband and I have been getting dark chocolate-covered almonds from the local Trader Joes (also a great place for plenty of gluten-free products!). Add the health benefits of almonds to the already mentioned health benefits of dark chocolate, and you’ll find it easy to justify consuming this delectable treat. They have a few varieties. One has Belgian chocolate and they’re sprinkled with sea salt and turbinado sugar. Mouth watering yet? If you haven’t tried them, they are “to die for”. They’ve been tweeted about on Livestrong.com and http://www.candyblog.net/blog/item/trader_joes_dark_chocolate_almonds/. By the way, In the U.S., 25% of all peanuts and 40% of all almonds are used in chocolate making. We are currently thinking it’s time to lay off the chocolate-covered almonds. But “I have this theory that chocolate slows down the aging process…It may not be true, but do I dare take the chance?”—Unknown. Enjoy this month of the heart! Since this is the month of heart connections, I thought this heart opening pose was a perfect one to highlight. Backbends (like Cobra Pose) help to release emotions held in the rib cage and can help to counteract depression. Think of the position held when laughing boisterously with your hands on your hips as you throw your head back and open your chest to the sky and you’ll easily understand why backbends help relieve depression! Now think of the position held when you are under stress or fear—hunched shoulders raised toward your ears and curling toward the ribs, head drooping down, shallow breath, clenched teeth and other muscles in the body. You can see why backbends help counteract the physical and emotional effects of stress (chronic fear) on the body. Backbends open the front of the body, the heart center/heart chakra. This center is your center for love, compassion, and support. When you are feeling love, you have less room to feel the fear. If THAT doesn’t make you want to do more backbends, consider that it is said you are as young as your back is flexible! Resting on your belly, place your hands palm down on the floor by your shoulders next to your chest. Hug your elbows to your sides. Firm your glutes and abs. Using your mid-to-upper back muscles, lift your heart center as you elongate your spine up and away from the tailbone to the crown of the head. Resist the urge to push into your hands. Keep your neck in line with the spine, chin tucked, neck soft. Draw shoulders back and down. Traditional texts say that this pose increases body heat, destroys disease, and awakens kundalini. Sources: YogaJournal.com, Beth Shaw’s YogaFit, second edition. “A heart meditation is a time to dwell with everything that is in your heart. We all need a way to enter the world of feeling and warm ourselves at the inner fire. This is a good practice to do toward the end of the day. Be in a cozy place. Light a candle, or settle yourself in front of a fire in your hearth. You can be sitting up or lying down. This meditation is about cultivating the sense of warmth and light in your heart, thus healing the cold and frozen places. You can do this practice a hundred times and every time have a different experience. Begin by thinking of someone or something you love without reservation. Notice the sensations in your heart as you remember your love. You may feel lightness, expansion, aching, or melting. You may feel joy or sorrow. Breathe with those feelings. Allow yourself to be with whatever is there. When we love someone or something, we want to pay attention and we delight in paying attention. Attention, in essence, is love. Let your love teach you how to pay attention to the flow of life within you. Now bring your hands to your heart. Rest your palms on your chest. You will feel a place that wants contact. As you breathe, you may notice a rising and falling motion under your hands, the soft flow of breath. Let your fingers and palms ride those gentle waves. Feel the warm contact of your hands against your chest. Imagine that warmth penetrating deep into your heart. You may feel your heartbeat. The heart is designed to love, to express, to give and receive. Notice your longing to be in the presence of what you love. Let your heart be warmed by your love. Let the warmth melt any cold or frozen places, any part of you that is aching, afraid, grief-stricken, lonely, disappointed, or bitter. Let the flame of your love warm you from the inside. Make a humming sound, such as “mmmm,” “home,” “huuum,” or “ohhhhmmm.” Keep saying it over and over, feeling how the sound vibrates your chest. In a causal, exploratory way, send the “hum” into your heart. Continue making the “hum,” letting the sound become quieter, just a whisper. Gradually let it become an internal sound you are thinking or remembering. Then let the “hum” fade away, knowing you can return to it at any time. Once again notice the contact of your hands on your heart. Slowly open your arms outward, as you would to embrace someone. Take a few breaths in this open-arm position, and then slowly, very gently, bring your hands back to your chest. You are returning to your heart, bringing that embrace into your own heart essence. Repeat this movement several times with great leisure, as if you want to make the motion last as long as possible. This movement is an expression of the give and take of your love. Sometimes we ache because we are not receiving enough love, and sometimes we ache because we are not giving enough love. This simple motion of in and out from the heart—opening to give and drawing in to receive—is a yoga of the heart, a way of expressing balance in giving and receiving. Intention: I am awake to love. I am ready to give and receive. I am in the flow of love. Source: Meditation 24/7, Practices to enlighten every moment of the day by Camille Maurine and Lorin Roche, PhD. We’re focusing on all things heart centered this month, so the heart chakra is on-deck! Do you follow your heart even when your head is telling you otherwise? That’s a tough one. We are often encouraged to follow our heart and not our head, but sometimes we may feel we have to defer to “logic”. Sometimes, however, your heart is so strong; your logic has to agree with it. As a personal example a year and a half ago, I was faced with a decision regarding my full-time employment. Economic changes were causing the powers that be to rearrange my duties of nine plus years. Economic times being what they were, the most logical choice would have been to stay with full time employment, but my heart would not let me choose that option. I knew I’d be very unhappy with the new arrangement—enough so that just the thought of it was affecting my health in a myriad of ways. That’s when logic had to side with health which happily sided with the heart. See what I mean? The heart was so strong, logic had to agree. “Negative emotions such as anger, frustration, and anxiety (all emotions I was feeling) disturb the heart rhythm. Positive emotions such as appreciation, love, or compassion produce coherent or functional patterns. Feelings, distributed throughout the body, produce chemical changes within the entire system.” The Subtle Body, An Encyclopedia of Your Energetic Anatomy by Cyndi Dale. Other “research conducted at the Institute of HeartMath (IHM) Research Center showcase the heart at a key intuitive center, responding even to information about the future.” The Subtle Body, An Encyclopedia of Your Energetic Anatomy, by Cyndi Dale. So following our heart isn’t exactly fool’s play and sounds an awful lot like intuition. The chakra of intuition and clairvoyance is the third-eye chakra, but wait a minute. Cyndi Dale, the author of The Subtle Body, An Encyclopedia of Your Energetic Anatomy, believes that each of the major chakras (she talks of twelve) house a different type of psychic ability. So while I almost added the third-eye chakra to this month’s focus, I decided to focus on the heart chakra only and its intuitive aspects. Don’t we often refer to following our heart as following our “gut”, or intuition? Enough said. Isn’t your heart really telling you what you want to do—what you should do? Sounds like intuition to me. Clairvoyance and intuition “develop in a much wiser stronger way, naturally, along with the development of the heart chakra. The more open one’s heart, the easier one finds it to understand others, and therefore to accept, forgive, and embrace them. When this development is part of the evolution of the human heart, then intuitive abilities develop naturally, within a spiritual framework.” Meditation, Path to the Deepest Self, by Michal Levin. The heart is “an organ of communication that can potentially manage the body’s intuitive processes. It’s organically capable of performing certain brain-like functions. In fact, between 60 and 65 percent of its cells are neural, identical to those present in the brain. Energy—information that vibrates—flows constantly between the heart and the brain, assisting with emotional processing, sensory experience, memory and derivation of meaning from events, and reasoning. Under correct conditions, such as when a person consciously ‘centers’ or focuses in the heart, the heart begins to run the brain. (Most typically, the brain runs the body.) Entrainment or the management of the body through the heart rather than brain leads to higher functioning mental and emotional states, as well as a healthier body. It also enables a person to screen the outer environment for ‘good messages’ instead of ‘negative messages,’ enabling a more positive relationship with the external world.” The Subtle Body, An Encyclopedia of Your Energetic Anatomy, by Cyndi Dale. So we use our heart chakra—our heart’s energy system—to intuit the world, and by following the heart, you have a healthier body. Just when you think your brain is running the show, research finds that the heart initiates the first response to incoming events. So what are some ways to work with your heart chakra? We already talked about how backbends alleviate depression in the yoga pose section. The physical practice of yoga deepens your awareness of your body so you become more conscious of your choices. Yoga helps its practitioners learn to trust themselves—to follow their heart. One of my overriding themes in my yoga classes is to listen to your body and honor what you find. The heart chakra also influences the lungs so breathwork is another great way to work with this chakra. I found the following wonderful breathwork exercise called “Heart Breath” from one of my favorite yoga ezines: http://www.yogamint.com. The author is Siri-Gian Khalsa, Intuitive, Healer and Teacher of Soul Connection. “Start with long deep breathing through your nose. Now, just on the exhale, feel as though the air that you are exhaling is actually coming out of your heart center. How does that feel? Do you feel movement in your heart? Do you feel your world opening, getting brighter? Are you feeling calmer and more peaceful? Next, if you find that someone is bugging you, or even yelling at you, or if you are in a group that is not getting along, or your children are noisily unhappy, just do this fascinating Heart Breath. Consciously direct the opening, expansive space you’re feeling towards them. As you do, track the miracles of change happening before your very eyes. They happen subtly, but very naturally. Did the experiment above make you a believer that emotions reside in the body? For those of you that can’t buy emotions residing in the tissues of the bodies, let me remind you of “the numerous reports of organ transplant recipients who later experienced changes in personality traits, tastes for food, music, activities…” It’s in the repetition of holding an emotion within your body that embeds it into the tissues. Paul Pearsall, MD, a psychoneuroimmunologist and author of The Heart’s Code, has researched the transference of memories through organ transplantation. After interviewing nearly 150 heart and other organ transplant recipients, Pearsall proposes the idea that cells of living tissue have the capacity to remember.” For more examples of this, go to http://www.viewzone.com/memorytest22.html. Louise Hay has written about this subject in several books. Try You Can Heal Your Life for starters. She includes a directory of ailments and emotional causes for each with a corresponding affirmation to help overcome the illness. Another good book on the subject is Your Body Speaks Your Mind, Decoding the Emotional, Psychological, and Spiritual Messages That Underlie Illness by Deb Shapiro. She includes a system-by-system guide to your body that reveals what it is telling you about yourself. Other ways to work with the heart chakra include doing what we love to do. This can be as simple as a few minutes spent enjoying the sunrise or sunset and as complicated as moving to a foreign land to take a job in the field of your dreams. Both are energizing and activate the heart chakra. Only you know the desires that reside within your heart. Your dreams and desires are as unique as your fingerprint. Start small. Pick something small that you love to do that is easy to add into your schedule regularly, and do it. You’ll not only feel a sense of accomplishment because you’ve added something fun to your life, you’ll also feel nurtured and loved. That’s activating your heart chakra energy. How about just enjoying the moment? Sometimes I have to stop and remind myself that I may not be exactly where I want to be, but right here is pretty darned good. Just having gratitude for where you are at can be very empowering and uplifting. You can enjoy more joy in your life simply by noticing it. Let me repeat that again: You can enjoy more joy in your life simply by noticing it. How easy is that? “Play a game with yourself today, seeing how much delight you can extract from every situation. Find the richness within each interaction and experience that you have. Savor the sweetness that today (and every day) brings you.” Daily Guidance from Your Angels, 365 Angelic Messages to Soothe, Heal and Open your Heart, by Doreen Virtue, PhD. Use the power of laughter to energize the heart. “Laughter is sacred. Laugh more, play more, and sing more to harmonize yourself with the natural world. Even humming moves your vibrational chord outward to mesh with the universe and all of humanity. (See last month’s newsletter for more on the many benefits of humming.) Delight in the unfoldment of this great musical that you call ‘life.’ …A heart filled with gaiety, mirth, playfulness, and laughter is a heart filled with Nirvana-essence.” –Laughing Buddha / Maitreya section in Archangels & Ascended Masters, by Doreen Virtue, PhD. She goes on to say that when you are laughing, notice how your heart fills with warm love, peace, and utter security. If I didn’t spend time simply being with my husband each day, I’d feel downright depleted. There are those that say we’re joined at the hip, and they’d be right. To some it might appear over the top, but until you’ve been there, don’t knock it; and once you’re there, you’ll feel your heart chakra expand with joy. “And those who were seen dancing were thought to be insane by those who could not hear the music.” –Friedrich Nietzsche. Being with someone you love also connects your heart chakra to your root chakra as highlighted in my November 2010 newsletter: Taking a few minutes to connect with someone you love—be it human or animal—can be very grounding. I know from experience that when I’m the most stressed, just feeling my husband’s arms around me provides the most nurturing grounding experience. It’s immediate. We send heart energy out whenever we hug or touch someone, but also when we hold them in our affectionate gaze. I’ve always been attracted to the eyes. I think you can say a lot without saying a word just through the eyes. So let your heart speak through touch—both physical and mental. Get or give a massage, go dancing, or go for a walk with someone you care about. Even going for a walk by yourself exposes you to the world and allows your heart to connect with others. Remember: to love yourself is one of the primary principles of healing. Do something nice for yourself. Twice today in my inspirational readings I was reminded of this. What did you immediately think of when you read the first sentence of this paragraph? Do that. Here’s my personal example: I love touchstones—basically crystals, stones, or gems. I have them everywhere. Stones from the Earth, be they gems or river rocks, talk to me. They each have a story, just as we do. Their life on this earth gave them the form we now see, and this form contains the lessons of that life. So the first thing I thought of when I read the suggestion to do something nice for myself was the beautiful natural stone necklace I saw at the magical retail store I teach at on Thursday’s in Anoka: Krista Artista Gallery. http://www.kristaartistagallery.com/ . I don’t wear much jewelry now that I am teaching yoga full time, so I have not indulged myself in my passion for touchstones lately; and have a hard time justifying the spend on my new income. Unwittingly I have been using the law of attraction wrong. The more I focus on my income not being enough, the more “my income not being enough” I’ll attract. Now that doesn’t mean I’ll buy the exact necklace I’m thinking about, but I am reminded that whatever you do for your inner self is always appreciated. So allow more of what you love into your life to keep the flow going. It doesn’t have to be expensive—just be kind to yourself. That could mean taking care of your body through sleep, exercise, healthful foods, and protecting yourself from negativity. To have more energy, abundance, peace, purpose, and everything that you desire, nurture yourself. You deserve it. Making time for yourself pays big dividends. I’ve quoted it before in my yoga classes: the inner you needs the outer you to take care of you. Give to yourself as much as you give of yourself. That’s healthy heart chakra—balancing both giving AND receiving. The ability to relate resides in our heart chakra. How well do you relate to others and they to you? What are some ways you can work on improving those skills? Just listening more can increase your ability to relate tremendously. Listen with your heart. That’s even better. Going back to laughter being the best medicine, make it a point to seek out those that aren’t smiling and go out of your way to put a smile on their face. All that you can take with you is that which you give away. Give a smile. “Finding a few minutes once a day to be silent in your own company will help you to see opportunities and new solutions that would improve the quality of your life. Crystals can help to bring balance into our energy systems but it is up to us to maintain and build upon that state of balance. Use some green stones to bring some of the qualities of nature into your home. (See the Gem therapy and the Heart Chakra section below for some heart chakra stone suggestions.) Set a small space aside in a corner or on a table. Keep it clear of everyday clutter, and arrange some of your favorite green stones there, together with a beautiful plant and a candle, or other items that help you feel calm and relaxed. 1. Take two minutes a day to sit and look at the stones. Sit comfortably in front of them, light the candle or burn some incense. 2. Take up one or two of the stones and hold them in your hands, close your eyes and relax. You are making a space in your mind, your emotions and your life for new things to enter. 3. Open your eyes to look again at the stones and then close them again and think of the space you are creating in your mind. Repeat if you wish. 4. When you have finished, return the stones to their place. The energy of any room in the home can be enlivened by having a small quiet space somewhere within it. This exercise easily creates a meditative state. Using a green crystal as a focus of attention naturally calms the mind and acts as a support to the entire process. Sit in a comfortable position and take a minute to settle yourself. Have a green stone in front of you—the type is not important. 1. Look at the stone, letting your eyes rest on it gently. Keep looking at the stone and let your mind be aware of your breathing. 2. After a few minutes, close your eyes and imagine you are breathing in the color green. If you get distracted, open your eyes and gaze at the stone for a while longer, then close your eyes and breathe in the color green again. I am quiet and listen to my heat’s song. I am free to enjoy every precious moment of pure love with my beloved. I am love. I am peace. I am light. I follow my heart’s desire for truth and goodness and love. Joy is my reason for living. I look for the joy in myself and see it in all things. I let my heart shine. I treat myself with love and respect. I’m in charge of my schedule, and I’m generous with myself. I deserve the same affection and care as everyone else. I notice and enjoy how sweet my life is. I count my blessings and am grateful for what I have. Power Thoughts, 365 Daily Affirmations, Louise L. Hay. Archangels & Ascended Masters, by Doreen Virtue, PhD. Daily Guidance from Your Angels, 365 Angelic Messages to Soothe, Heal and Open your Heart, by Doreen Virtue, PhD. Try: http://www.healingdaily.com/juicing-for-health/juicing-recipes.htm, or http://dkmommyspot.com/nutrient-rich-vegetable-soup-or-how-to-make-soup-without-a-recipe/, or www.foodnetwork.com/topics/soup. Other heart chakra nourishing foods could include green tea and green herbs such as basil and immune-boosting oregano. Aromatherapy and theHeart Chakra : Scents associated with the heart chakra are some of my absolute favorites such as angelica, jasmine, rose, geranium, and bergamot. There’s also lilac, lavender, orange blossom, neroli, and ylang ylang. For the heart chakra’s influence on the lungs try eucalyptus and peppermint, among others. Some Heart Chakra gems are: Rose quartz, malachite, green tourmaline, ruby, green emerald and aventurine, among others. “Green stones strengthen the main quality of the heart chakra, which is to grow and expand in a harmonious manner in such a way as to fulfill the individual’s core needs. Personal space and freedom to be oneself are essential for wellbeing and health. We can use crystals to help us achieve our goals in life, both by giving us quiet in order to see things more clearly and by encouraging growth of qualities we need. ..choose crystals to encourage qualities that are needed for you to succeed. Encourage optimism and clarity with yellow crystals. Calm with green stones, ability to learn with blue, co-ordination with violet. A clear quartz can reinforce your intention if it is programmed….Use some green stones to bring some of the qualities of nature into your home.” Healing with Crystals and Chakra Energies by Sue and Simon Lilly. All yoga poses are essentially grounding and activate the chakras. Poses that open your heart center area poses we emphasize here. I highlighted cobra pose in this month’s “yoga pose”. This is a great heart opener. Others include Fish pose, Bow pose, Camel pose, and Yoga mudra pose done while standing, among others. This month of the beloved calls for a mudra to connect with your loved one, accept your differences, and experience the true power of two hearts united in love. Sitting with a straight spine, connect the thumbs and index fingers, forming a circle. Spread and extend the other fingers. Lift your arms to your heart center and cross your left wrist over your right wrist with the palms facing out. Hook your pinkies together. Keep all fingers extended and hold for at least three minutes breathing long, deep, and slow. Affirm: I am free to enjoy every precious moment of pure love with my beloved. Weve talked about the heart being a key intuitive center, responding even to information about the future and intuition developing more strongly with the opening of the heart chakra. This deck is another deck by Shakti Gawain on Developing Intuition. (I highlighted her Creative Visualization deck back in my May 2010 newsletter). As I mentioned in May, Shakti Gawain is an author Ive admired for over twenty years. I own many of her works, and have not been disappointed by one of them. As I reviewed the deck for which cards to highlight here, I was drawn to the ones that talk about checking in with the body since that is exactly what I tell my yoga students. Card #1: Checking in with yourself each day can be extremely powerful. You dont need much time. With practice you can learn to quickly and easily drop out of your mind and into a deeper place inside. Card #2: Inner guidance can come in the form of words, mental images, or feeling impressions. You may feel a radiant warmth, or sense energy flowing through you. This site also has samples of other cards for you to peak at! Fun site! This deck is from her book of the same name which you can purchase from her wonderful Website: http://www.shaktigawain.com/products/books/developing-intuition-practical-guidance-everyday-life. Yoga for dry eyes? You bet! The researchers assigned half the group to a yoga class that met for an hour a day, five days a week. The class included asana (yoga poses), pranayama (breathwork), and guided relaxation. Those in the other group spent equal time in the company’s recreation center talking to friends, working out, and watching TV. By study’s end, the yogis reported a 30 percent decline in eye problems like dry eye; eye complaints increased in the other group. The authors note that relaxed people blink more, which moistens the eyes. There is nothing like a delicious chocolate and many times the over processed confections that are sold in many stores often don’t hit the spot for real chocolate lovers. How do we resolve that? Well we find this delicious Chocolate Raspberry Bonbons recipe from Elana’s Pantry of course! It’s just an added bonus that these are gluten free and vegan friendly as well so even more of you chocoholics can enjoy them! For those of you who love mantras, this is a wonderful addition to your collection. For those of you who arent familiar with listening to mantras, I suggest you try this one. Deva Premal and her partner in life & music, Miten, have brought the ancient healing power of Sanskrit mantra into the Western musical mainstream, with worldwide sales of nearly one million. You dont always need to understand the words to feel the meaning. But if the meaning intrigues you, their Website gives that to you as well! The title, Love is Space, drew me to highlighting it during this month of the heart. The second song on the album is one of my soul-soothing favorites. Its soothing like a lullabynot surprising since Deva Premal grew up singing mantras as bedtime lullabies. Enjoy! Deva Premal and her partner Miten are gifted musicians who travel the world opening people’s hearts. Deva Premal is a native of Germany. Miten, who accompanies and produces all the CDs, is from England. They met and fell in love in India, where each had gone on spiritual pilgrimage and to study the rich musical heritage of this mystic land. They now spend their lives touring the globe, giving concert and workshops in Europe, Australia, Japan, India, Canada and the USA. They offer much more than music, they offer a doorway to the heart and a journey into bliss through song and mantra. Graced by ancient mantras and multi-level harmonies, LOVE IS SPACE glows with an inspiring, heart-centered passion. 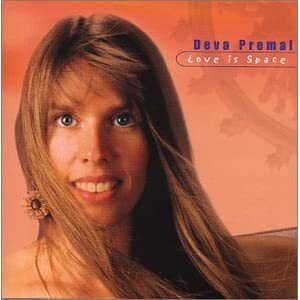 Deva Premal’s voice, like silk, like liquid bliss, is accompanied by Jai Uttal, Miten and Kit Walker’s amazing keyboard and rhythm tracks. LOVE IS SPACE, as the title suggests, is a journey into the spacious golden land of chant. This is amazingly sensual music that is ideal for yoga, meditation, healing work, and, not least of all, slow passionate dancing. Energetics of Yoga Weekend Intensive / TeriLeigh /April 8-10, 2011 / CEU’s for teachers! $250 for the weekend or $15 per hour pre-registration. 15 gifted Psychics, Body Workers, Holistic Health, Yoga, etc will be there!